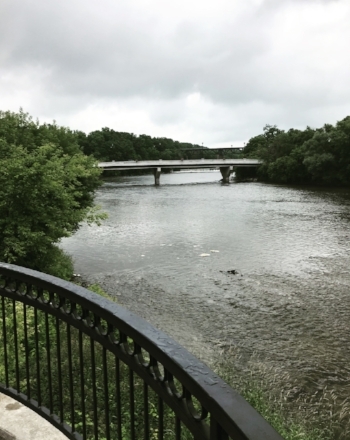 I travelled to the lovely town of Paris, which is situated alongside the Grand River, and falls within the Haldimand Tract. I had lunch in a cozy restaurant right next to the river, a welcoming place with a modern feel. I drank water and ate an absolutely delicious veggie pizza (that was served with these fabulous toasted chips) and felt proud of myself for making such a healthy choice. Sitting there with my iPad, I realized I carry these lingering concerns about loitering—a holdover perhaps from being a teenager and always feeling like I couldn’t be anywhere for longer than twenty minutes without buying something, and was once again filled with gratitude and appreciation for our house. Having a house has made such a difference to my creative life. Really and truly. There is a lot to be said about being able to stay in one place and just keep going with whatever project it is that I’m working on. I know how important a safe space is to so many people, for so many reasons, and I will always remind myself and my children to not take it for granted. But I digress. (I noticed while editing this that I do that a lot in this post and I hope you will forgive me!). Anyways. As I was sitting there eating, a little bird came and sat by the window, and flew away when I attempted to take its picture. Which was completely understandable. Aren’t we all of us, a little too photographed these days? I don’t know for sure which peoples, (if any), believe that photography will steal their soul or what their teachings or ideas are around that, but lately, I’ve been wondering if perhaps there isn’t something to that. Today I found myself reflecting on what self imagery might do to one’s sense of personal story, and recalled that we actually do have our own teachings about that with the story of the corn husk dolls. I wondered if we are too exposed, if some force calls to us, and makes us feel like we need to share so much of our lives. I wondered about how we answer that call, and if doing so makes it more difficult to have a life we can truly enjoy, treasure, and hold sacred. (“Pictures or it didn’t happen,” as Amanda Palmer sings on one of my favourite songs). I wondered a lot of things, I guess, and reached no real conclusions. Just sat, and thought, and wrote. And continued taking pictures to mark my visit. One thing I did realize sitting there, was that I really do take a ton of photographs. There are no fewer than 11,000 photographs on my phone. Pictures of forest, and water, and Cayuga paradigms. Pictures of my art, or of things that inspired me in the moment. Pictures of special occasions, many of which center around my husband and my daughters. I realized that despite any concerns or misgivings I have about them, I truly do love and value pictures. Pictures help us to share our stories and our truths. And lately, I’ve been feeling like I need some help in this area, especially since there are so many stories I want to write. Isenne. Cora. Rowen. Each of them have a story that is so vivid and alive in my mind. I think about them all of the time, and I want more than anything to have the time and space to write them. But i can’t because I’ve been consumed with trying to finish my dissertation, a mountain I feel like I have to climb before I can really focus on exploring language, writing and art the way I long to. I’m much closer to that goal now, and I hope to have completed a draft (a very rough draft, to be sure), over the next few days, which means that I will finally be able to start getting back to doing the kind of writing I actually love. So my adventure was really about trying to reconnect with my stories, and see what work I had to do to rebuild a relationship and familiarity with them. And so, I went on this little writing date. Just me, my computer, and my notebooks. The pieces from my cousin's store. It was, quite honestly, the best thing I could have done. I managed to work through some of the stumbling blocks I was having with each of my stories and quickly saw that I was experiencing a similar challenge with each of them. I made some good notes, finished up my visit to Paris (including a quick stop at my cousin Julie’s consignment store where I bought two lovely pieces of pottery) and when I got home from my adventures, I got straight to work. I took out my post-it notes, my whiteboard, my whiteboard markers, and proceeded to strengthen (and in one case, create entirely anew) three outlines that will help guide my daily writing and carry these three novels to completion. It was honestly, a very wonderful day. I’m so incredibly grateful to have been able to enjoy this day and work on stories I care so much about. And as a result of today’s work, I hope to have a few new projects ready to come out this fall!